In this post, at last, I can reveal my amazing news which I barely could hold to myself. On February 8, I won amazing giveaway which was giving of beautiful Mónica from Freesia Blog. In this giveaway prize was custom illustration. Mónica isn't just beautiful lady with amazing sense of style, she's great Fashion Blogger, she's incredibly talented Graphic/Fashion Designer as well. At first I couldn't believe that I was a winner and after a while I start to think what could Mónica create for me. Mónica suggested that she could update my blog header. Gosh, I forgot how terrible was my blog title looking. I even didn't thought fight back, but I hadn't clear vision how should look my header. I let Mónica's imagination run free or perhaps I put all the responsibility and pressure on her. I just mentioned that I would like use as my symbol Fleur De Li's. On April 23 I received email from Mónica which included her final work - my blog header and widget for sidebar. My jaw dropped. I was stunned how AMAZING was looking my blog header. I just couldn't believe that she did all this work for me. I was staring on it for a while, looking on all of lines, lights and shadows. AMAZING!!! From the bottom of my heart -Thank You very, very much! P.S. If you haven't been yet on Mónica's Freesia Blog I must say straight away you should visit her and leave some lovely comment! this is awesome! congrats on your win :) that is such a beautiful photo! 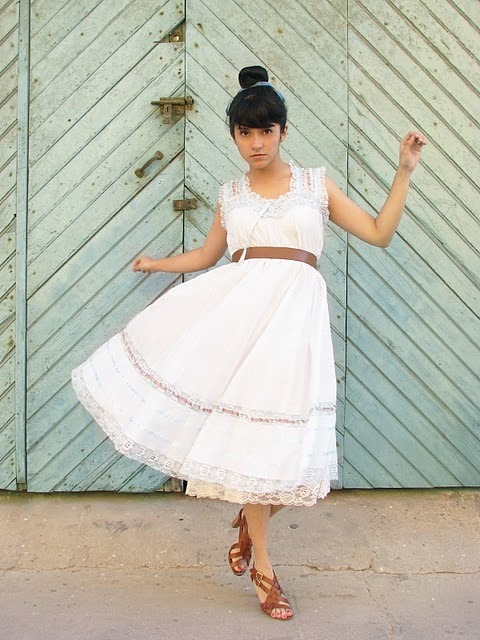 i love monica's style and congrats in winning her give away! lucky you!Mónica is a darling, and a very talented and stylish girl! Love your outfit from the previous post! I noticed the new header even before I read the post. I am so excited for you! congratz! I'm curious which header she will create for you... funny but few months ago i was thinking to make a similar give-away :) AN illustration is definetely something special!